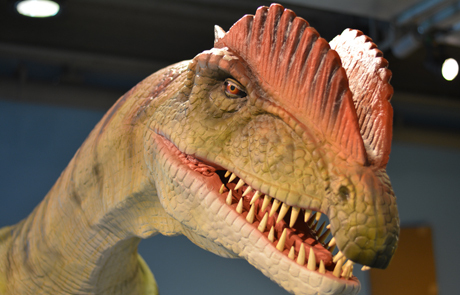 Highlighted by a life-size animatronic Dilophosaurus, Explore•a•Saurus invites children and families to assume the role of scientist and explore the evidence, the science, and the features that make dinosaurs so compelling. Explore•a•Saurus is more than just looking at dinosaurs – it is about observing fossil evidence and developing one’s own theories about how dinosaurs may have looked and behaved. Visitors can touch and measure a fossil footprint and learn what clues it gives about a dinosaur’s size. Families can manipulate a full-size model of a dinosaur, learn about how they moved, and rearrange bone puzzles to learn about dinosaur anatomy. Explore•a•Saurus is organized around the questions that kids most often ask about dinosaurs – How big were they? How fast did they move? What did they do? What did they look like? Each exhibit area presents direct evidence about some aspect of dinosaur anatomy or behavior, encourages visitors to analyze that evidence, and invites them to develop their own theories based on the evidence. Because many questions are still debated in scientific circles, these questions are an invitation to see science as a living and continuing endeavor. The science skills that kids practice in Explore•a•Saurus – measuring, estimating, using tools, using math, solving problems, developing theories, examining evidence – are the same STEM skills that appear in Next Generation Science Standards and other current science standards. These skills or “habits of mind” are critical throughout children’s schooling, and throughout their lives. The STEM investigations in this exhibit build from children’s natural curiosity and excitement about the prehistoric world of dinosaurs.